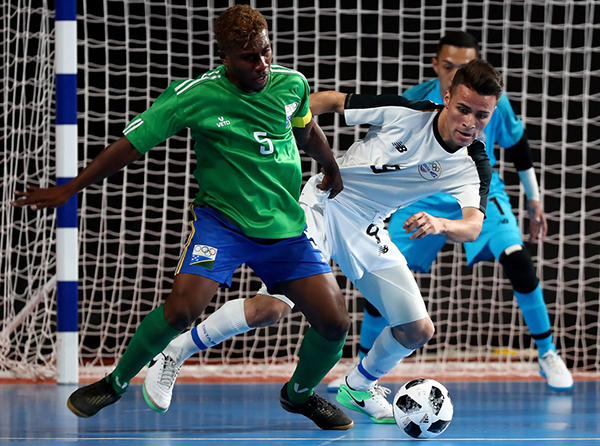 The Solomon Islands U-18 futsal team have to contend with a second straight defeat after being soundly beaten 11-6 by a clinical Costa Rica during their second Youth Olympic Games match in Buenos Aires today. Solomon Islands made a strong start to the encounter at the Futsal Main Stadium in front of a boisterous crowd of over 1300 people. However the chances they created within the first minute came to serve as an omen for the side in this match as they failed to find an opener and could only watch in despair as Jafeth Carvajal took the honours instead. Going behind didn’t rattle the Oceania youth futsal champions too much, biding their time and keeping things tight in defence. Another prime chance for the Junior Kurukuru had them 3v1 with just the keeper to beat but they couldn’t capitalise once again. However the side were soon leveling things up with a fantastic strike from Leon Kofana in the fourth minute. Costa Rica, who lost their opening match to Russia 6-1, proved to be superior finishers adding a further three goals before Solomon Islands struck back once more through Kofana. Two more goals took Costa Rica to six goals and a late strike from captain Junior Mana in the first half saw things sitting at 6-3 going into the break. Rafael Le’ai was first to find the back of the net in the second half and he was later joined on the score sheet by Franster Rukumana but Costa Rica also stepped things up with captain Yosel Leon scoring three in quick succession to take his match tally to four. Three more goals were scored in the second half by Costa Rica, including one in favour of the Solomon Islands, taking the final score to 11-6. Next up for Solomon Islands will be another tough opponent in Russia, with the match scheduled for Friday 12 October at 10am (SOL time).